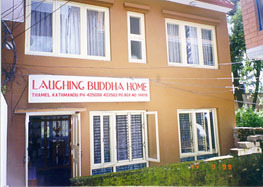 A Home in the Heart of Thamel ................... Excellent Service ........ 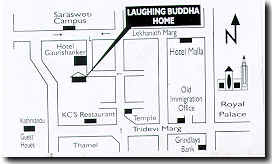 Reasonable Price......................" Home Away from Home "
The Laughing Buddha Home welcomes guests from all over the world. We are in a quiet spot in the heart of the busy Thamel district of Kathmandu, and we hope that as soon as you arrive you will feel very much at home. Location: We are in the Thamel where most tourist visit and stay for arranging their program, one of the liveliest areas of the city, within walking distance of many restaurants, shops, and some of Kathmandu's famous attractions. Our guesthouse (home) is around 15 minutes drive from the airport. It is a cosy and comfortable 'home away from home', with a lovely rooftop garden to relax in at the end of the day. 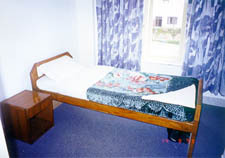 Accomodation: We have both single and double rooms, with en-suite bathrooms. Every room is clean and comfortably furnished, with wall-to-wall carpeting. 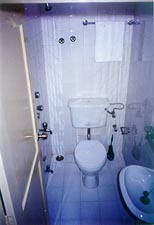 Our rooms are inexpensive price. Our home has solar-powered water heating, and hot showers are readily available. We are happy to provide breakfast and dinner at every reasonable prices. to provide transport from the airport to our guest house, please ask us about that when you make your reservation" today. "Although we only opened our guest house in 1999 we have already received many recommendations from people who have enjoyed their stay with us, and many of our guests tell us they have come to us because they have heard about us from their friends." 10% Government Tax is not Included in above Rates.